Self-esteem has six basic components. Today’s picture book selection addresses all of them: Mastering tasks and skills, valuing one’s own strengths and qualities, feeling loved and appreciated, learning to express one’s feelings, acknowledging and coping with fears and accepting and loving oneself. I know that parents and teachers will enjoy the simple eco-friendly craft project at the end of my review. The main character of the story loves singing and Wednesday’s guest post was from Daria, a talented musician who travels around the globe, sharing her passion for music with young children. I hope everyone will check out her post and visit her amazing websites! She provided us with several great musical instrument-making crafts and is giving away a wonderful poster that celebrates music around the world. A very talented bear-cub is sent as a birthday gift for the king by a loving old couple. As the bear-cub travels to reach the king, he meets and helps many people. When he finally arrives at the palace, the king’s birthday is long over and the guards lock him up in the dungeon because he is so late. While in his prison cell, the bear-cub sings a sad and beautiful song about his travels. Will the bear-cub spend the rest of his days in the dungeon? Does the king ever find out about his special present? What will happen to the old couple? The foundations of our self-esteem are laid in the first five years of life…I love picture books that celebrate any of the six components that help a child develop a positive self-image…and this book addresses all six! 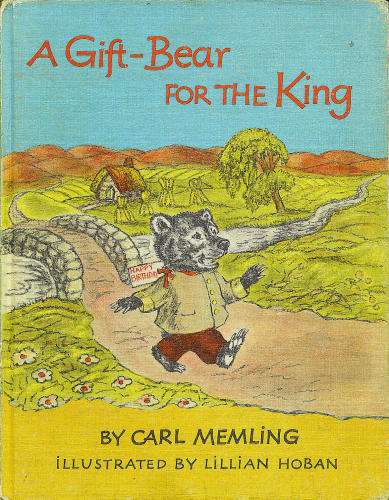 Gift-Bear for the King was my oldest son’s favorite story…we both knew it by heart by the time he was four. Gift-Bear could sing, stand on his front paws and wash the dishes…he was always ready to help those in need. Young children will be singing along with the refrain before you turn the last page. The illustrations, in Lillian Hoban’s inimitable style, are charming. There are quite a few crowns and other hat-making craft activities here. There are excellent step-by-step crown-making instructions with photos here. The crown you help your child make can be as simple or as fancy as you like. The picture is from a kit you can buy from Oriental Trading Company. I included it to show you how ornate you can make the crown…but your child will enjoy wearing a simple one also. You will need: Construction paper, buttons or sequins (optional) crayons or markers, glue, scissors. 1. Cut strips of construction paper and measure to fit your child’s head. Piece together with glue if necessary. 2. Cut a zig-zag along the top edge. You can make it fancy like the one above or just simple. 3. Let your child decorate with crayons and/or markers. 4. If you wish, add “jewels” cut from different colored construction paper…or buttons…or sequins. Glue into place and let dry. 5. 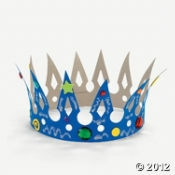 Fit the decorated crown strip to your child’s head and glue the two ends together. 6. Important tip: Most of you are too young to remember one of the first “reality” shows, Queen for a Day, where an ordinary woman was featured and given prizes and made to feel very special. Perhaps your child can be Queen or King for a Day in your home…helping choose the dinner menu, picking the family game that will be played. Feeling loved, valued and appreciated is such an important element in building self-esteem…children who are confident are less likely to be victims of bullying. This entry was posted in children's picture books, Crafting with Children, Friendship, Music for children, Perfect Picture Book Friday, Reading with Children, self-esteem and tagged children, Lillian Hoban, Picture book, Susannah Leonard Hill by viviankirkfield. Bookmark the permalink. The King and Queen for a day crowns are precious! And fun to make. This story sounds utterly delightful! The dungeon sounds dreadful. I sure hope he is freed. I love books that our kids memorize because we read them so much. Thanks for adding it to the list! Thanks so much for linking up with favorite thing this week. I absolutely love how you always include projects to do with the books you suggest. Thanks so much for sharing! I think I am going to get this book for my girls! I’m happy you liked this book review and craft! If you want to get a copy of Gift Bear for the King, try the library or used bookstores…or half.com or Amazon. 🙂 This book is just one of the 100 I recommend in my parenting/activity book. Do you know about the 2012 PPP Reading Challenge and prize every month? If a parent or teacher posts a comment on my blog about what books they are reading with their children, they might win a new picture book…one lucky winner every month!!!! You can just add the comment on any March post…or click on the Positive Parental Participation logo on the right sidebar and it will bring you to the “official” comment page for March. 🙂 I’d love it if you would spread the word to the moms you know…the more, the merrier! Thank you, Catherine…I loved your selection…”It’s Me” and will try to get a copy to use in my school programs! Glad you liked “A Gift Bear for the King”. And yes, kids love to be queen and king for a day!!! Gift Bear seems like the perfect bear. The dungeon — not so much. I’ll see if I can find this one for my son. Seems like great book and activity! I’ll have to check out the book and try the activity! Sounds great! I think self esteem is super important, too. Vivian, I love your recommendations because I learn so much. I hadn’t heard of the six components of self esteem. Thanks for offering such great information along with your reviews. I’m sure my six components aren’t the only elements that contribute to a positive self-image…but they are the ones I addressed in my book and I think that if a child masters tasks and skills, feels appreciated and valued, etc…that child will have high self-esteem! Great review. I love the crown activities. I guess we are spoiled here in the US, with Amazon and half.com and ebay…and very reasonable shipping if you are in the continental US. I know it is quite expensive to ship outside the continental US…I’ve shipped my book to Canada and India…and will be sending a copy to Singapore next week. Is there any European outlet like Amazon where the shipping would be more reasonable for you? Lillian Hoban’s illustrations really take me back to my childhood. Bread and Jam for Frances was my absolute favorite growing up. I haven’t seen this one before but would love to check it out. Thanks, Vivian! Oh yes, Amy! Bread and Jam for Frances…I didn’t include it in my recommended hundred picture books in Show Me How because I intend to do a couple of “sequels” and one of them will focus on building relationships…sibling rivalry, friendship, bullying/teasing…so I was saving that gem. 🙂 But I love that story!!!! You really are creative with your crafts — you must have grown up crafting. I love the activity with this book. Such a beautiful book and I want to know what happens. A singing, loving bear must capture some hearts. Love this! Thanks for sharing. Thank you, Pat! I do love crafting…I can remember sitting at the kitchen table with my mom, working on a diorama made from a shoe box. My mom had been a nursery school teacher before she got married and she was a “stay at home mom” and loved to do crafty stuff with me and my sister. I like your idea of queen or king for a day! This looks like a fun book. I am all for those books that help develop a positive self image. Thanks so much for adding it to the list! WOW! Thanks, Marcy…I will put my thinking cap on and see if the “Light” bulb goes off! You are so welcome, Susaana! Delightful book — and great craft and activity suggestions! Thank you! Hi Vivian, I do enjoy books with a musical theme – with unforgettable characters that children can grow old with. Two years back, we had a Picture Books that Sing theme over at GatheringBooks and we had a great deal of fun finding books based on songs: Chelsea Morning by Joni Mitchell and Forever Young by Bob Dylan among a few. I know that this one is a tad different but it has likewise caught my eye. Will check out our community libraries for a copy of this one. So happy you stopped by, Myra! My kid got fairly excited when she saw the pictures in this post. Might have to pick them up. I’ve never heard of this book, but it sounds lovely. Thanks for sharing! Loved the book you picked for PPBF this week, it looks and sounds adorable. The bear cub looks so sweet nowonder he makes many friends along the way… thankyou for sharing Vivien. Every little girl wants to wear a crown…and should!!! !